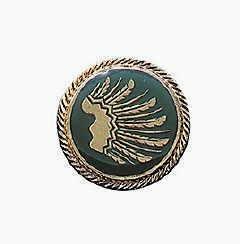 Recently, a number of pins have been posted for post war Schutzenverein. This a subject rarely discussed on post war German forums so I would like to start one. If you have uniforms, pins, pictures etc of these organization please post them to this thread and add to our knowledge base on these shooting groups. To start with, here is a brief wiki article on this subject. "A Schützenverein (German for "marksmen's club") is in a local voluntary association found in German-speaking countries revolving around shooting as a sport, often target shooting to Olympic rules or with historic weapons. 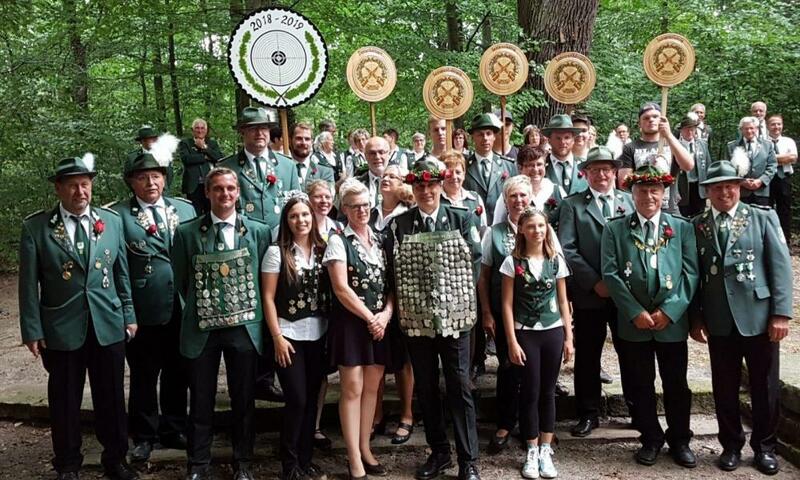 Although originating as a town militia, a Schützenverein has no military aspects and in many cases often has a more social than sporting purpose. These associations originated in late medieval autonomous towns as a form of citizens' militia principally to defend the town. Germany has over 15,000 Schützenvereine, with most of them affiliated to the "Deutscher Schützenbund" (German Marksmen's Federation, DSB) umbrella organization. The DSB was founded in 1861 in Gotha and revived in 1951 in Frankfurt am Main following World War II. The DSB's 1,500,000 members makes it the third largest sports organisation in Germany. Other organisations for sport shooting in Germany include the Bund Deutscher Sportschützen, "Bund der Militär- und Polizeischützen" and the "Deutsche Schießsport Union". These focus more on the sport and offer a wider variety of shooting styles and competition types than the DSB, particularly in the field of large-bore firearms. Each Schützenverein organizes shooting events, including at the very least an annual Schützenfest. Weapons used may include air rifles, air pistols, small bore weapons and crossbows. Schuetzenvereins were founded in the United States by German-Americans and acted as a social club for their communities. Each club had a range for target shooting and often also a bar. Larger clubs could have extensive facilities such as an inn, dance hall, music pavilion, zoo, bowling alley, roller coaster, refreshment stands, athletic field, picnic grounds, and other amusements. It was common for tens of thousands of people to attend a major event. The popularity of these facilities began to decline in America around 1917, when the anti-German sentiment from World War I restricted the activities of German-Americans and led to the prohibition of the use of the German language in public. Many businesses and organizations changed their German names or dissolved. The American Schützenvereine were dealt another serious blow in 1919 when the "Prohibition Act" outlawed the manufacture and sale of alcoholic beverages, the consumption of which was casually mixed with shooting activities. Schuetzen Park in North Bergen, New Jersey and Schuetzen Park in Davenport, Iowa recall the tradition. The former Deutsch-Amerikanische Schützen Gesellschaft building stands at 12 St. Mark's Place in New York City's East Village, and has been a designated landmark since 2001. Most of you will not be aware that these clubs exist in America as well as in Germany. There are also shooting clubs in other countries but I am going to limit myself to Germany and the U.S.A. Here are a couple of pictures showing members of a German Schutzenverein. You will note that individual medals/awards are worn separately. However, I have a medal bar in my collection that I have pictured here as well. Anyone else out there with a schutzenverein medal bar? If so please show it. 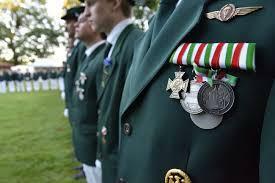 I am member of a traditional german shootingclub for over 40 years. There are a lot of badges, pins and medals in this organisation. There are awards for traditional shooting like the bar in your picture, given for "Schützenkönig" and other winners of this competition. Also awards for membership in the organisation 25, 40 50... years. Awards for officials in all levels of the shooting organisation and last but not least awards for shooting competitions. Here are some of my pins for shooting competitions from upper franconia and bavaria. Thanks for adding to the thread and explaining about the many types of pins that are used within these organizations. Here as a picture of pins from my collection. Some of these pins may not be related to the schutzenvereine but they all came to me at the same time so I put everything in the photo. 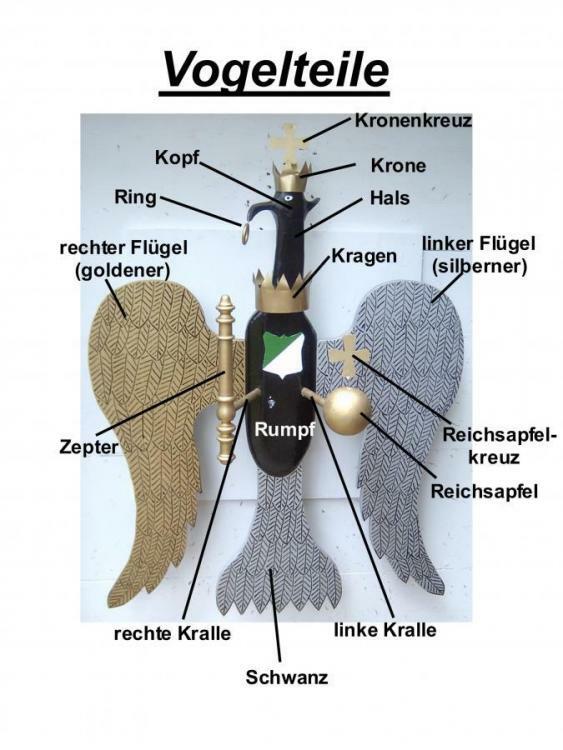 The green pins with parts of a bird are awards for a special traditional competition, called "Vogelkönig". If you seperate one part of this wooden bird, you win the special pin. 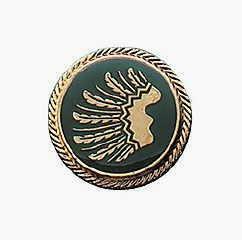 In your collection are several kinds of shooting pins of traditional and sporting competitions. I think all are shooting pins. Thanks for explaining the "bird" parts on the badges. I wasn't aware of this before so your explanation is very useful. Several years ago I started conversing with a chap in Europe re these types of badges. He told me that he had access to what he called a "rag mill" where discarded clothing was ground up for recycling purposes. He was able to have the badges removed from the tunics before they were destroyed. I asked him if he could get me some tunics, complete with badges, from the rag mill and he was able to do that. Here is one of the tunics that I now have in my collection. Thanks for your comments. I can not answer your questions but perhaps spolei will. In the meantime, here are pictures of some of the different varieties of the pins/medals that can be awarded in this type of competition plus another picture of the bird involved. I would like to add one more tunic to this thread. This tunic came with yet another type of medal for this type of shooting contest. 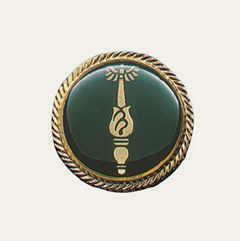 The are indications on the tunic that there were many more shooting badges on it at one time. Unlike the previous tunic this one comes with a cuffband showing the club that the owner of the jacket belonged shot with. The shoulder boards are removable. This is a nice topic. Target shooting is one of my alternate passions. Thanks a lot Gordon. I see this particular shoot was outdoors so it may be from a more considerable distance? Time to add more tunics from my collection. This one is very different from my other shooting club tunics. If from the Kyffhauser veterans organization which in post war time devoted a lot of its time to shooting. Now for the last tunic in my collection. A most interesting topic. Many thanks for sharing. Good to see the Kyffhauser veterans organization tunic. Will check to see if I have any post-war Schutzenverein related items. "22 caliber @50 feet or the metric equivalent?" There are about 14,000 marksmen's clubs (Schützenvereine) in Germany. The regulations are accordingly different. Different distances, different weapons and different terms for the components of the birds. Weapons can be small calibre, air rifle, shotgun, crossbow, bow and arrow or others. "Can I guess that the idea is if you hit the crown off that would earn you a higher grade?" Not necessarily; that depends on the regulations of the club. Normally the crown is only a part like the other parts. Crucial for the honour of the King (Schützenkönig) are the club regulations. It could e.g. 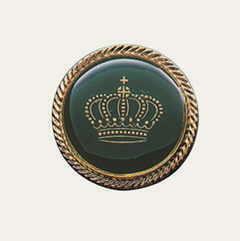 be the crown, the body (Rumpf), the orb (Reichsapfel), the last part of the bird or others. Thanks for your post. Interesting information.